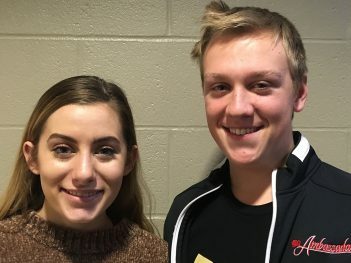 When Carmel High School senior Laney McNamar was in elementary school, she attended a show choir workshop conducted by North Central High School’s mixed show choir Counterpoints. CHS choir teacher Kyle Barker decided it would be a good idea to offer the first workshop for middle school students in Carmel. Barker student-taught at North Central High School, so he was familiar with its workshop. The Half Notes Show Choir Workshop is for fourth-, fifth- and sixth-graders and will be held Jan. 25. The Ambassadors, CHS’s mixed show choir, will help instruct the youngsters. Junior Jack Martin, who is in his second year in Ambassadors, said he loves working with kids. Barker is in his second year at CHS and serves as lead director for the Ambassadors. The program begins at 4 p.m. and runs through halftime of the CHS boys basketball game. The Half Notes, the workshop attendees, will learn a show choir routine to The Jackson 5 song, “Blame it on the Boogie,” and then perform it at halftime. For more, visit carmelchoirs.org.